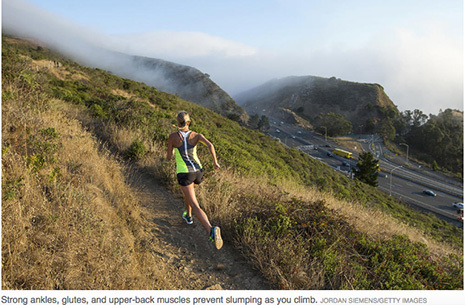 Many runners dread hills, but training on them confers benefits that help you run better on any terrain: glute and leg strength, a more efficient stride, and greater aerobic capacity. To stay healthy, perform these moves at least twice per week. Do the sequence once as a prerun warmup or four times as a workout on a nonrunning day. Read full article at, "Run Up Hills Without Getting Hurt," Runner's World, April 2017.